Lyft is an on-demand transportation company based in San Francisco, California and it matches drivers with passengers that request rides through a smartphone app, available for iOS and Android. 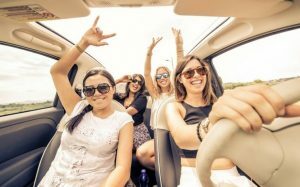 It gained popularity alongside other ride-sharing services in the last 2-4 years, and it is a great side-hustle if you would like to gain some extra money. In general, a Lyft driver makes 20-30$ per hour but this number can grow substantially if you know a couple of tips. We compiled a list about how you can make money on Lyft and also improve your starting point rate. As the studies reported in TIME demonstrate, your profits as a driver for Lyft vary depending on your city, your competition and by the way you choose your working hours. Depending on the area you choose to work in, you will have different types of rider concentrations. For example, if you live in a college town, you might find a lot of demand near campuses. You should try and prioritize areas from your city in order of relevance. For example, nightclubs, restaurants, train stations, airports are great locations where you will find plenty of ride requests. Even though it is true that late hours are pretty tough to work, they are clearly the most profitable. From 4 am to 6 am the roads are clear, there is little to no competition between drivers and it’s the easiest way to raise your profit. Drive around party areas (nightclubs, restaurants, bars etc.) or accept rides that are longer in distance like rides to the airport. Don’t drive around at peak hours, even though fares may seem high and attractive. You might end up losing money on gas or be overtaken by competition. This is a trick that is not necessarily known by everyone, but which brings you back a lot of profit. Here is what you need to gain this bonus. Convince a passenger to download the Lyft app, create an account and introduce the unique driver code that Lyft gives you when you become a driver. When that person takes his first ride, you will be paid 10$ on the next day. You can go to bars or events and hand out cards with your code, share it among your family and group of friends. This offers you a great advantage because you don’t have to only rely on driving. Your car must be in a very good shape so that the client feels comfortable there. Don’t eat or drink inside your car, make sure that you wash and vacuum your car on a regular basis, even your trunk. Be careful about using air fresheners, certain people are bothered by strong scents and this could lower the satisfaction of your clients. A happy client, most of the time, means a 5-star rating and a tip, so you have to be very careful about how your working space looks. Small things are often the ones that matter, and standing out in the eyes of your client is the most important thing. You can improve your riders experience by offering extras, such as water bottles, hard candy, tissues or smartphone chargers to ensure a 5-star rating and a good tip, but don’t overdo it. Stay away from offering handmade cookies or over-the-top objects. In conclusion, being a driver for Lyft is a demanding task, but it can also give you substantial profits. It depends on what areas you choose to work in and at what hours you are available, so it might take a while until you find the combination that works for you.